The imposing stone structure located on State Street at the head of Fourth Street was built in 1818 as the almshouse for the city of Hudson. Under the New York laws of 1778, towns and cities were responsible for the care of their own poor. Previously, the poor of Hudson had been sheltered in a house, also located on State Street, which had been purchased for the purpose in 1801 from Daniel Allen. Around 1830, Columbia County established a poor farm on land purchased from John C. Hogeboom, and the poor of Hudson, together with paupers from the towns throughout the county, were moved to the county poor farm. In May of 1830, Dr. Samuel White, who had been practicing medicine in Hudson since 1795, established an insane asylum in the building, which he ran himself, assisted by his son, Dr. George H. White. Dr. White was a pioneer in the humane care of the mentally ill. An advertisement for his institution, published in 1841 and quoted in Ellis’ History of Columbia County, stated that “in the first ten years three hundred patients were admitted, most of whom were cured, and all were benefited.” Dr. White’s asylum closed when the state asylum at Utica opened, and his patients were transferred there. 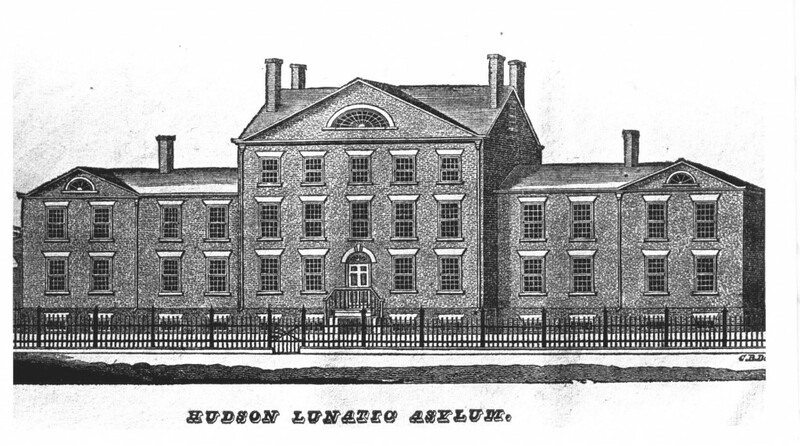 In 1851, the Hudson Female Academy was established in the building, under the direction of Rev. J.B. Hague. The school enjoyed a “high reputation” and attracted students from as far away as Detroit, Milwaukee, the West Indies, and Europe. Henry Ary, who painted the portrait of George Washington that hangs in the Common Council chamber in City Hall, as well as numerous views of Mt. Merino, the Hudson River, and the city of Hudson, was on the faculty and taught drawing and painting to fourth-year students. The building occupied by the Academy, was originally erected at a cost exceeding twelve thousand dollars. By an additional outlay it has been perfectly adapted to its present use. It is situated on a gentle eminence, commanding a view almost unrivalled in extent and magnificence. It contains a large and beautiful schoolroom, recitation rooms, and numerous other apartments, arranged for carrying on to the best advantage, the work of instruction. Hair Mattresses (sic) are used throughout sleeping apartments. Each room is carpeted, and furnished with table, bureau, &c., and in the arrangements generally regard has been had to comfort and elegance. In 1865, the Hudson Female Academy moved to a building at the corner of First and Warren Street, and by 1878, when Ellis’ History of Columbia County was published, it was no longer in existence. 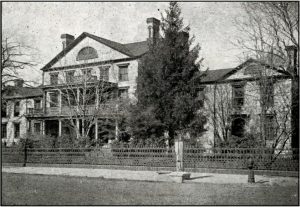 When the Hudson Female Academy relocated, the building on State Street became the private residence of one of the school’s trustees, George H. Power. George Power was a major force in the development of ferries and river transportation in Hudson. His, Father, Captain John Power, had come to Hudson from Adams, Massachusetts, in 1790 and began boating on the river as early as 1804 or 1805. He founded the freighting firm of Power, Livingston & Co. and owned the first steamboat in Hudson, the Bolivar. George was born in Hudson in 1817 and began his career in the river at the age of seventeen as the master of a vessel owned by Jeremiah Bame. Eventually George Power becomes the owner of the New York and Hudson Steamboat Company, the Hudson and Athens Ferry, and the Hudson and Catskill Ferry. The ferry boat that ran between Hudson and Athens bore his name. He was one of the original trustees of the Hudson City Savings Institution and served two terms as the mayor of Hudson. George H. Power lived at 400 State Street from 1865 until 1881, when he sold the building to the Hudson Orphan and Relief Association and moved to 218 Warren Street, the grand house built by Thomas Jenkins, the richest of the original Proprietors. From 1881 until 1957, the Hudson Orphan and Relief Association operated a home for orphans and needy children in the building. In 1957, the organization, then called the Children’s Home of Columbia County, suspended custodial care of children, and the orphanage building and grounds were given to the Board of Education of the Public School System of Hudson with the stipulation that a library be developed in the building. In 1959, 400 State Street became the home of the Hudson Area Library. This history of the library building was prepared by Historic Hudson, INC., based on research materials available in the library’s History Room.